For this discussion, I'll be using Hachiman as the example god, and also using the chart from the old Team Dignitas article he and I have referenced in various threads. *NOTE* This discussion is mostly about finding a good balance between POWER and ATTACK SPEED. It will touch upon other points such as ability use/damage and penetration/protection reduction, but those are not the focus. It does not take into account added function stats such as The Executioner protection reduction stacks or critical strikes, so is meant to be conceptual. First, let's get familiar with the following chart. The yellow-highlighted cells represent the highest DPS based on the balance of basic attack damage and attack speed. - Being above the yellow cells means your attack speed is higher and it's more beneficial to your DPS to build power. - Being below the yellow cells means your power is higher and it's more beneficial to your DPS to build attack speed. I'll be factoring in a mirror match Hachiman at the same level, accounting for basic attack damage mitigations from inherent protection (at base... The Executioner stacks will NOT be factored in). Basic Attack Damage is actual damage per hit on enemy. Mark 2: Level 6, enemy @ 22% mitigation. 3 points in Heavenly Banner. Hunter's Blessing is evolved. Add Devourer's Gauntlet at 0 stacks. Basic Attack Damage of 87, Attack Speed of 1.228 (+ .1 - 0.2 w/ Banner active / in range). Mark 3: Level 10, enemy @ 28% mitigation. 5 points in Heavenly Banner. Devourer's Gauntlet at 50 stacks. Add Ninja Tabi or Warrior Tabi (different paths). Ninja Tabi Basic Attack Damage of 120, Attack Speed of 1.48 (+ 0.15 - 0.3 w/ Banner active / in range). Warrior Tabi Basic Attack damage of 134, Attack Speed of 1.28 (+ 0.15 - 0.3 w/ Banner active / in range). Mark 4: Level 14, enemy @ 26% mitigation. Devourer's Gauntlet is evolved. Add The Crusher. Ninja path Basic Attack Damage of 160, Attack Speed of 1.732 (+ 0.15 - 0.3 w/ Banner active / in range). Warrior path Basic Attack Damage of 175, Attack Speed of 1.532 (+ 0.15 - 0.3 w/ Banner active / in range). Mark 5: Level 18, enemy @32% mitigation. Add The Executioner. Ninja path Basic Attack Damage of 174, Attack Speed of 2.034 (+ 0.15 - 0.3 w/ Banner active / in range). Warrior path Basic Attack Damage of 188, Attack Speed of 1.834 (+ 0.15 - 0.3 w/ Banner active / in range). Mark 6 + 7 ( Qin's Sais + Brawler's Beat Stick in the Ninja Tabi pathway, sell Blessing @ Mark 7): Level 20, 34% / 26% mitigation. Add 5th / 6th items. Basic Attack Damage of 239 / 273, Attack Speed of 2.21 / 2.06 (+ 0.15 - 0.3 w/ Banner active / in range). Mark 6 + 7 ( Wind Demon + Deathbringer in the Warrior Tabi pathway, sell Blessing @ Mark 7): Level 20, 34% mitigation. Add 5th / 6th items. Basic Attack Damage of 205 / 211 (not including crits), Attack Speed of 1.96-2.16 / 1.81-2.01 (+ 0.15 - 0.3 w/ Banner active / in range). Crit Basic Attack Damage of 392 / 479 when it procs. What can we glean (if anything) from this chart? In the early game, before getting to your last 2 items, you're probably better off going with Warrior Tabi, at least for Hachiman. Hunter's Blessing (vs. S4's Death's Toll) provides a very nice attack speed boost once evolved, and his Heavenly Banner provides an additional (albeit situational) boost. The higher power will give a bit of extra damage to his abilities. In addition, anytime you face a tankier enemy (e.g. the enemy Support), it'll shift the chart points up, so Warrior Tabi, being at a lower position comparatively, will end up much closer to the optimal damage area against those enemies. Keep in mind that The Executioner will shift all points down as stacks are built and more protection reduction is applied. At this point, the Ninja Tabi path starts looking more attractive, especially against squishy gods not building protections. The next chart (below) will show the Ninja/Qin's build with effect from full protection reduction stacks of The Executioner. Both Qin's and crit pathways are definitely viable. As you can see from the chart, Qin's provides a higher base DPS...AND it becomes more effective against tankier gods. The crit path, when it DOESN'T crit, will have a lower DPS, but when it does hit, it blows past Qin's on a per-hit basis, especially against lower-health/lower-protection gods. As you see the benefit shift from Warrior Tabi to Ninja Tabi, it gives strength to the idea that you can build Warrior early (for those specific benefits), and replace late with Ninja Tabi. Other intangibles aren't discussed...keep in mind that Ninja Tabi gives a bit of extra mana (not all that needed for Hachiman but more helpful for other ADCs). Brawler's Beat Stick has anti-heal. Wind Demon provides added MS.
Just to give an example, you see some people build a very early Odysseus' Bow. This is generally not very optimal, even though you may feel pretty badass because you can shoot quickly, because your actual DPS suffers...this chart gives a clear depiction why this is. I've built it 3rd, after Devo's and Ninja (with the Blessing of course), just to show specifically why it's good to balance power and attack speed. Here's the chart showing the effect of full stacks of The Executioner. In the writeup below, the effect from full Exe stacks will be in parentheses. Did this quick, but think it's accurate. Mark 5: Level 18, enemy @ 32% mitigation (19%). Add The Executioner. 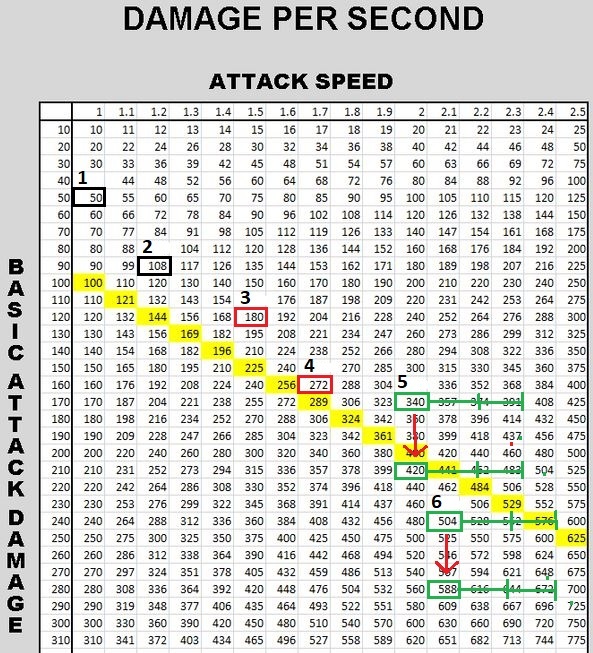 Ninja path Basic Attack Damage of 174 (207), Attack Speed of 2.034 (+ 0.15 - 0.3 w/ Banner active / in range). Warrior path Basic Attack Damage of 188 (224), Attack Speed of 1.834 (+ 0.15 - 0.3 w/ Banner active / in range). Mark 6 + 7 ( Qin's Sais + Brawler's Beat Stick in the Ninja Tabi pathway, sell Blessing @ Mark 7): Level 20, 34% (21%) / 26% (11%) mitigation. Add 5th / 6th items. 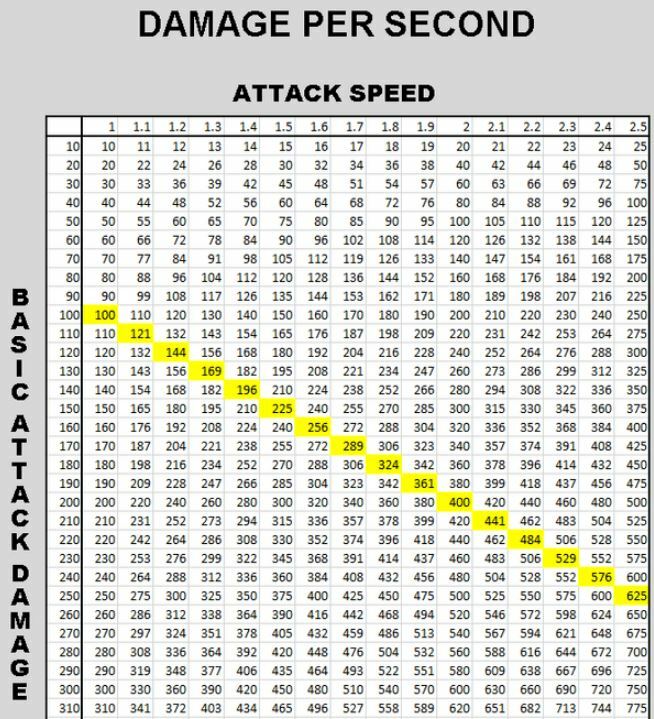 Basic Attack Damage of 239 (284) / 273 (330), Attack Speed of 2.21 / 2.06 (+ 0.15 - 0.3 w/ Banner active / in range). In essence, The Executioner provides some great DPS gain (as we know). The difference would be even greater if our target was tanky. I hope I've been accurate enough, and that this has been interesting enough to give you an idea of the general concept of balancing your build with appropriate stats as it progresses. Would love to hear some comments/thoughts. Woah, this is an awesome post! You mind if I link this as a reference in my guide? Absolutely! Any additional thoughts about this? I was thinking of doing a side by side chart showing the Exe damage shift at full stacks. That would be really interesting. I think the way you laid the information out over the chart is awesome. I think seeing The Executioner effects visually would be interesting, as would other starter items like Transcendence that increases in power over the duration of the game. Not trying to create more work for you or anything... lol! I just think seeing the information presented in this form is more enlightening. I applaud what you've done so far though, especially considering how many situational differences there can be. For example, the Heavenly Banner ability, blessings, player levels, mitigation numbers, etc.. Speaking of mitigation numbers, for Mark 3 on the chart, is that the correct mitigation percentage? Or was that just a typo? Or am I on drugs? The mitigation percentage is accurate, as far as I know. Remember phys protection increases as you level, so you'll see that go up. The reason you see it go down in Mark 4 is because of the pen in The Crusher. Also, that mitigation isn't linear. Although the phys protection increase as you level is linear, as you get more and more protections, it means less and less...so from Mark 1, you see 13%, then 22%...but at Mark 3, you might think it'd increase another 9%, but it's already slowing down, and you only see a 6% increase. And of course, from Mark 4 to 5, the prot reduction from Exe isn't calculated in that chart. It would have a pretty decent effect. Ah, okay. I understand now. Yes, The Executioner definitely has a big impact on the numbers. Also to consider are other small intangibles. 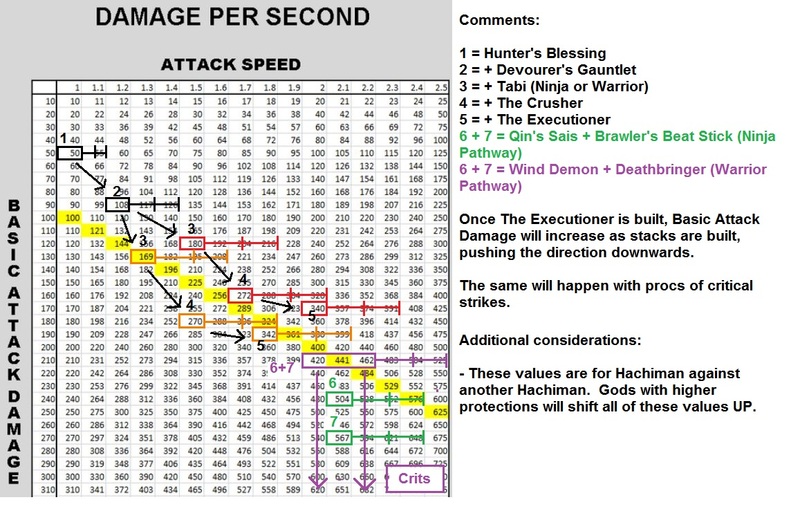 For example, higher Attack Speed would mean that you apply the Qin's Sais passive more, stack The Executioner quicker, etc.. Conversely, you could be missing several of your auto attacks anyway (something I like to do often =) ), so higher damage could be slightly valued to make the hits that you actually do land more significant. I think it is important to consider the balance between theoretical DPS and what might actually happen in a match, where your actual DPS could fluctuate on a consistent basis. There could be several situational discrepancies. Who is the target at the moment? Are they getting additional protections from outside sources (aura items, abilities, etc.)? Are you getting any buffs from outside sources? Etc., etc.. Here, I think individual item passives become more relevant, and could influence you to build it compared to others despite it giving you lower theoretical DPS. For example building The Crusher versus Toxic Blade. I just think it is something to consider while viewing any chart related to Smite. Alright, here's the new chart showing the effect of full stacks of The Executioner. In the writeup below, the effect from full Exe stacks will be in parentheses. Did this quick, but think it's accurate. How good is qin's for dps? Is it better than executioners? 1.93 As (base), 223 basic attack damage is what I get from my calcs via phone lol. This puts it very close to Exe at max stacks. I'll double check that later, but I'd say then that if you're ahead enough you can go for Qin's first. It's more expensive though so that should be considered. Exe can still be more beneficial though... I'm curious to see how it would do against tankier targets (will check that too), and the protection reduction means anyone you've applied it to means physical teammates will also benefit.